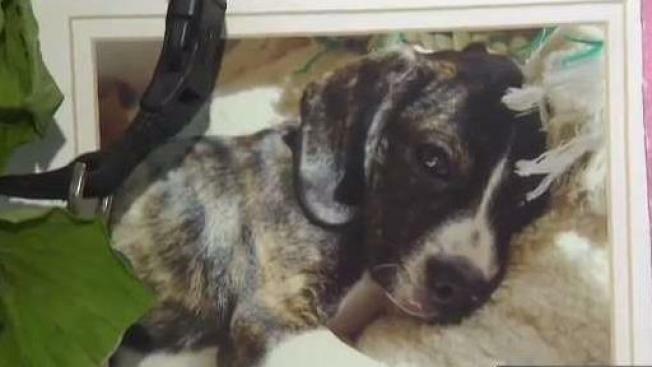 A family in North Hampton, New Hampshire spoke to NBC Boston about the loss of their dog in a hit-and-run Monday evening. A New Hampshire family is heartbroken after their beloved dog was hit and killed by a car on their street. Now, police are looking for the driver who took off after the collision. The Trowell family tells NBC Boston their dog, Patrick, was hit and then dragged 15 feet down the road. They think if the driver had stopped, they may have been able to save Patrick’s life. The way Ian Trowel talks about Patrick, you’d think the puppy was his first born son. "I taught him how to ride a kayak," Ian said. "He was just the sweetest boy." "He was part of our family," Ian said through tears. He and his wife Katie brought Patrick home from the puppy store nine years ago. "He had these eyes that just looked into your soul," Katie said. "He seemed like he was a human." And he’s been a major part of every milestone ever since. "He was the co-best man at my wedding," Ian said. Ian was at work Monday evening, when he got a frantic call from Katie. "It was, um, chaos," Katie recalled. She had found Patrick badly injured in the street right outside their home. "It was shocking and sudden and really horrific," she said. She rushed him to the vet, where he died before Ian could get there to say goodbye. "I gave him a kiss on the head that night before I went to work, just like I do every day, and then two hours later, my world just..." Ian trailed off. North Hampton Police now want to find the driver who hit Patrick and took off. The Trowels do too, because as they grieve the loss of their first baby, they say a simple apology would go a long way. "I will never be okay, I don’t care if it sounds ridiculous, I loved that dog," Ian said. "Just tell me you’re sorry and I’ll forgive you, my heart is so big." If you know anything about this hit and run, you should contact North Hampton investigators (603) 964-2198.